We recently wrote about spring crudités, but what else should be spring-ified? How about crostini, one of our favorite, easy-to-make nibbles. We serve them as snacks and with cocktails (including wine, beer and cider). You can also serve a couple of them as a first course, with a small lettuce salad. Take a selection of spring veggies and top crostini (the word is Italian for croutons, but in the U.S. it means “toasts,” as in small slices of toasted bread). *Morels and fava beans need to be cooked. You may elect to lightly steam some of the other vegetables. 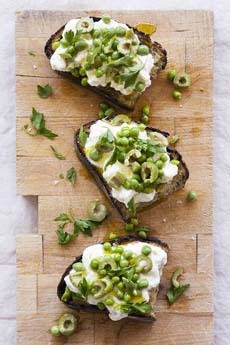 Crostini with burrata and spring peas, garnished with sliced olives and fresh herbs (photo courtesy Good Eggs). 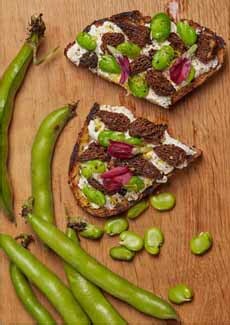 Crostini spread with ricotta and topped with lightly cooked morels and fava beans. Torn radicchio leaves add some color (photo courtesy Il Buco Alimentari). BRUSCHETTA VS. CROSTINI: WHAT’S THE DIFFERENCE? Bruschetta and crostini are popular hors d’oeuvres that are easy to make. They also can be served as a first course or a light meal, with salad and/or soup. Many people—even culinary professionals—confuse the two. What’s the difference? The answer, in brief, is the size of the slice, plus grilling versus toasting. Bruschetta (three or four inches in diameter) are cut from an Italian loaf and grilled; crostini (about two inches in diameter) are cut from a thinner loaf such as a baguette, and toasted. Bruschetta (pronounced broo-SKEH-tuh) are grilled bread rubbed with garlic and topped with any variety of items. The toppings can be as simple as extra-virgin olive oil, salt and pepper, to diced tomatoes and basil, to almost any spread, vegetable, cured meat or cheese—even fruit. Bruschetta originated in the Tuscany region of Italy, where it is commonly served as a snack or appetizer. It may have been the original garlic bread. The word comes from the verb bruscare in Roman dialect, which means “to roast over coals.” If you have access to a grill, grill the bread for authenticity. If not, you can toast it. Some American manufacturers and others in the food industry misuse the term, using it to refer to the topping only and selling jars of “bruschetta” (it should be bruschetta topping). Show your superior knowledge and don’t allow the term to be distorted: The word bruschetta refers to the grilled bread, not the topping. Crostini (cruh-STEE-nee) are croutons: not in the American sense of small cubes tossed into soup or salad, but thin slices of toasted bread. Smaller than bruschetta, the slices are typically cut from a ficelle, a thinner baguette one to two inches wide (the word is French for “string”). The slices are brushed with olive oil, toasted and then topped with spreadable cheese, pâté or other ingredients. Plain crostini are served with soups and salads, like melba toast, or set out with cheese.